I am in the sweet-spot, cooking-wise. The kids and husband are downstairs, watching a Mickey Mouse Christmas movie, and nibbling from a cheese and cracker plate. That cheese and cracker plate is my favourite part of any holiday: Braunshwager, brie, caviar, crackers, and this divine roll-up of mozzarella cheese and prosciutto. Some people don’t understand how anyone can possibly eat an extra 3500 extra calories on Thanksgiving, and I tell people like that, time to up your cheese and cracker plate game. I just ate a million calories of paté, myself. Then I washed it down with 3 pieces of fudge. And by ’3′, I think we all know I mean ’5′. In ten minutes, I have to take the sweet potato casserole out of the fridge so it can warm up before going in the oven, baste the turkey, check youtube for videos about how to insert the turkey thermometer in case I didn’t do it right, find the good placemats and napkins, empty the dishwasher for the 2nd time today, assemble the ingredients for the gravy, finish off the giblets, which I cook for the dog, and start ramping up to the main event, the Turkey. But right now, I have a few minutes, and here is where I want to spend it: saying ‘thank you’ to everyone who stops by to read this page. I am heartily grateful to you, the women out in the blogosphere giving me a glimpse into your own lives, and taking a peek into mine. I am grateful for your comments, and your emails. I see a lot written about the internet – that it is filled with anonymous bullies and trolls, and bad behaviour and mean-girl-ness - and I think, how strange. My internet isn’t really like that all. My internet is mostly smart, funny women with big hearts and sharp wit, who are swinging for the fences, who are appreciative of what they have, and who work hard to create happy families, happy communities, and live happy lives. I am so thankful for my readers and commenters, and for the marvelous women behind the blogs I read regularly. It is a small list, but a great one, and the ladies on my sidebar blogroll inspire me every day, through their words and actions. Surround yourself with the people that make you a better version of yourself, I think, even virtually. It’s the only way to go if you want to make something out of your life. I am so thankful to the women I surround myself with online, even the ones who have no idea who I am, whose blogs I read for inspiration. Thank you for reading this. I hope you have a marvelous weekend, and are cheese-plate adjacent as often as is humanly possible. ****PS: I have to humblebrag here. 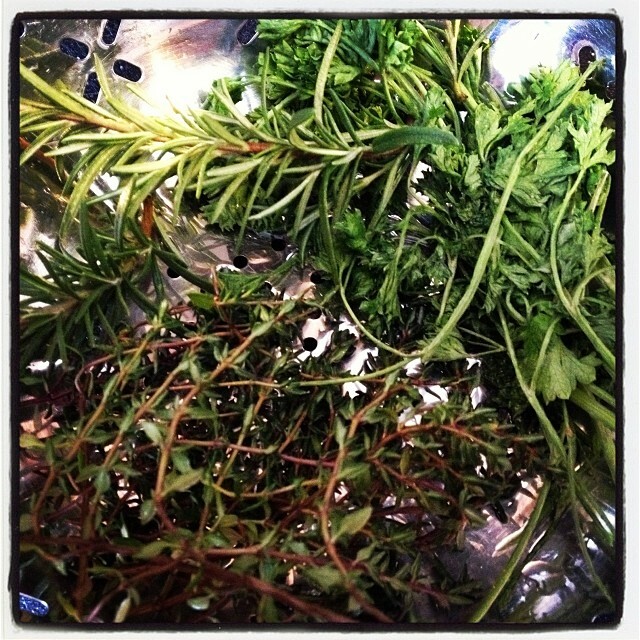 I GREW the spices I used in my stuffing this year, the ones pictured up top: rosemary, German Thyme, and Parsley. I am so over-the-moon about this it isn’t funny, partly because, having finally bought a house, I also finally get to have a real garden, and also because a significant chunk of my garden failed this year, due to me having no idea what I am doing. But nothing on earth kills Rosemary, once it starts going, and the rest muddled along beneath my horrible tomato plants, and voilá. It is the coolest feeling ever: I grew that! I made that happen!